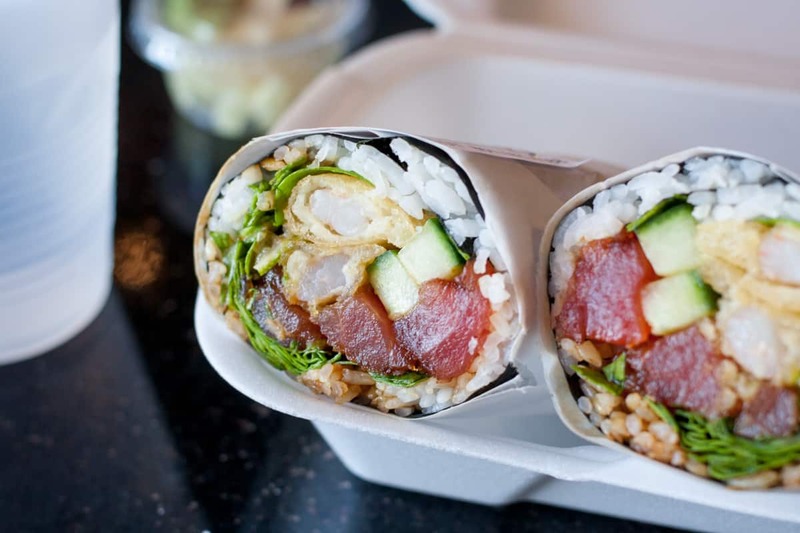 I’m sure you’ve heard of this trend: sushi in burrito form instead of bite site roll form. But did you know there’s a little shop serving them up right in Sandy, Utah? I go to the gym right by Sumo Burrito and I’ve been staring at it for months, telling myself I should go try it out. Finally I ventured inside and ordered, and I haven’t been able to stop going back since then. 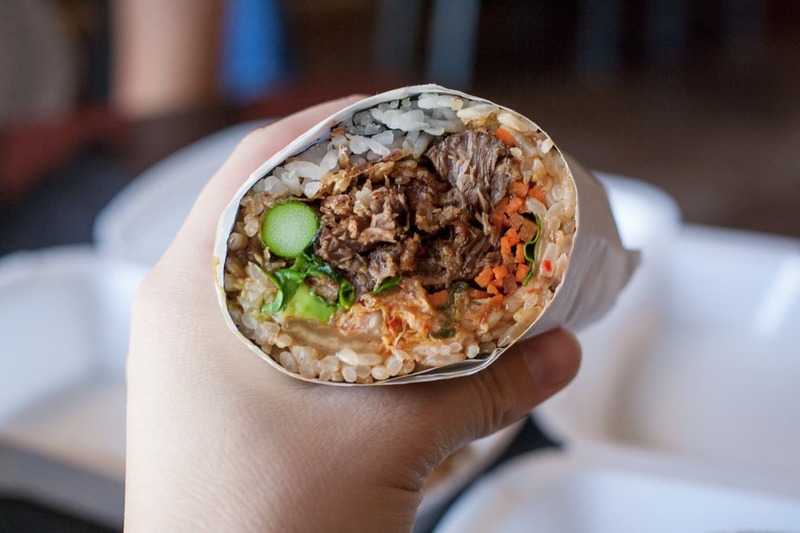 Sumo Burrito is a tiny little restaurant that packs a big punch. They have a simple menu with 10 choices of burritos, along with rice bowls and some sides and salads for your not-so-sushi-loving friends. My husband actually falls into that category (much to my dismay), but even some of the sushi burritos are more burrito than sushi! The first time I went, I tried the Vegas burrito. If you’ve ever eaten sushi with me you’ll know that I’ll eat anything that includes salmon, cream cheese, and/or avocado, and with all three of these, the Vegas was the obvious choice, along with some other yummy ingredients like snow crab, tempura flakes, and a sauce called terimayo. 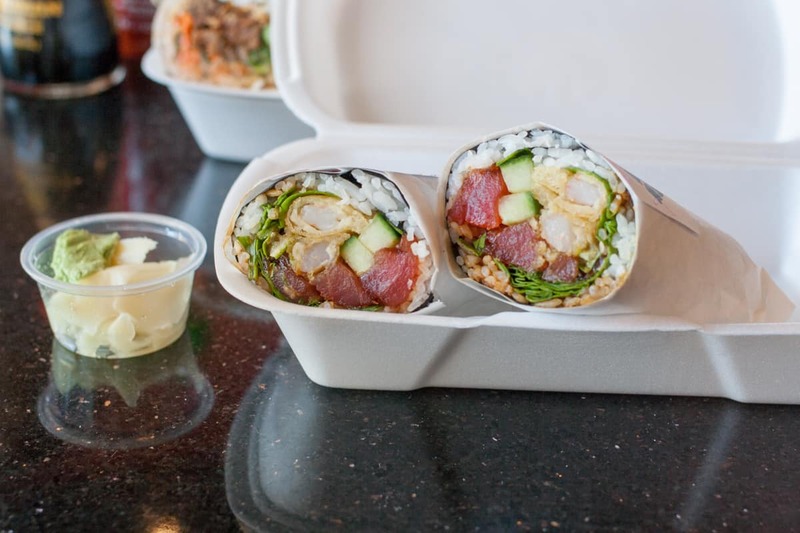 I chatted with the owner and chef about whether I had tried a sushi burrito before, why I was there by myself taking a bunch of pictures of his food (a common question), and what my favorite sushi restaurant in Salt Lake is (Sapa, if you’re wondering). My burrito was ready in no time and I chowed down. It was served with the regular sushi fixings – soy sauce, ginger, and wasabi – although it was so flavorful that it almost didn’t need any of those. It was wrapped with seaweed, which held together perfectly, and the bigger bites and cuts of fish made for an experience that I could relish in, both very different and very similar to eating old fashioned sushi. I knew it then: I was addicted. I went back a week later and dragged my husband along, telling him he could just get a rice bowl if he wanted. 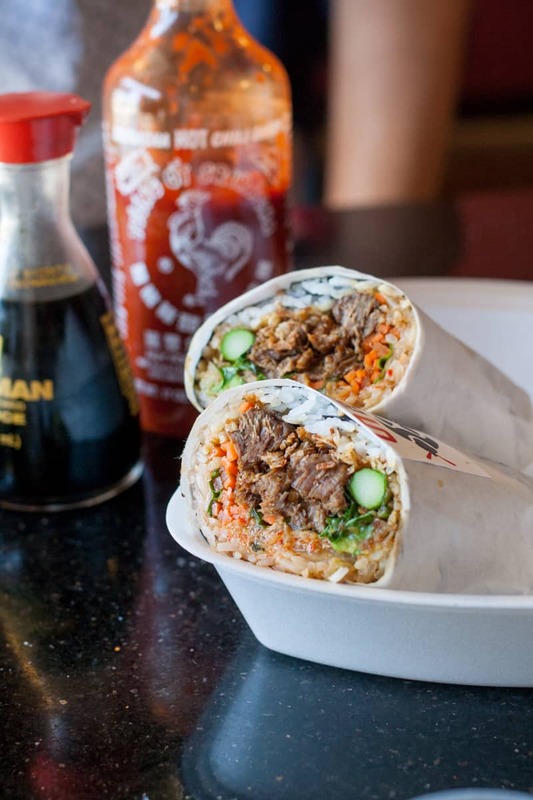 To my surprise, he actually ordered the Banzai burrito, which is stuffed with slow cooked beef, tempura, asparagus, carrots, crispy shallots, avocado, cilantro, kimchi, and teriyaki sauce. I decided to take a chance on one of their most popular items, the Spicy Samurai. The owner remembered me and I introduced my husband (and my camera – yet again) before we sat down. The Spicy Samurai arrived and I took a bite. 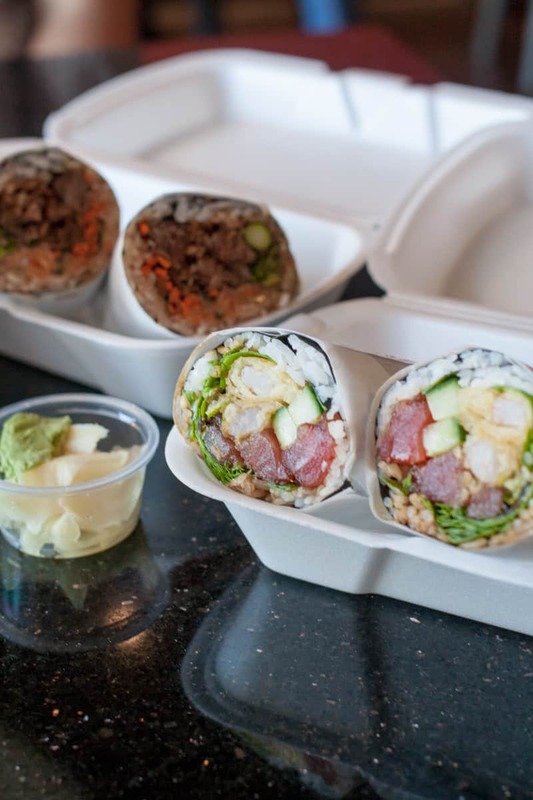 The menu lists its ingredients as tuna, shrimp tempura, avocado, cucumber, spinach, lime, eel, and a spicy pepper sauce. That pepper sauce is no joke. It has a deep, smoky flavor that I did not expect at all and it’s delicious but it is hot. I love spicy food and I was guzzling water. Colby’s burrito, on the other hand, was the opposite: light and crunchy with all the fresh veggies and the full taste of the meat. He devoured it and is now a fan of a sushi restaurant, which I consider a win. 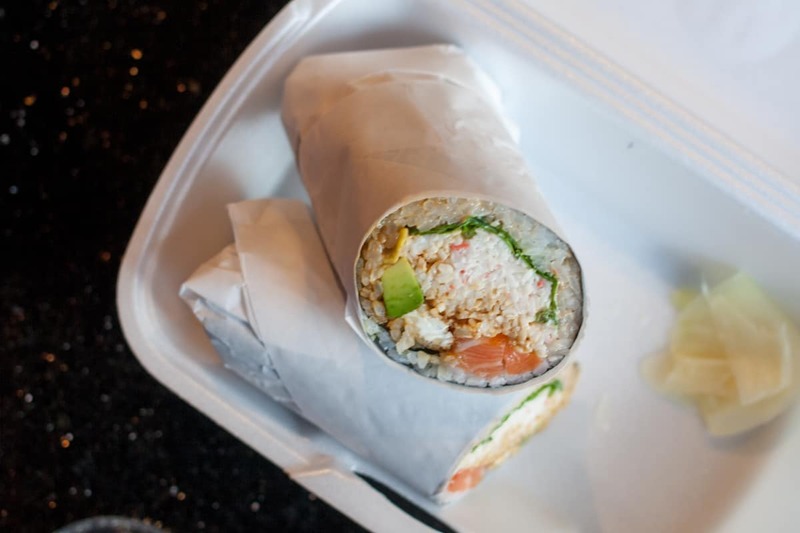 You can bet I’ll be back at Sumo Burrito very soon, whether it’s for a healthy after-workout meal or to satiate a craving on a Friday night. (PS: they do takeout!) Hope you will be too!